Imagine how pressing the keys of a grand piano feels different than pressing the keys of a high-quality electronic piano. Both types will have a ‘response’ or the tactile feel that a key has when it’s pressed, and ‘travel’ which is the distance and force needed to push the key to make a sound. The grand piano will have a more analog, clacky, tactile, individual responsive feel. The electronic piano may feel more like keys pressing into a single piece of electronic hardware. While pianist can certainly play with both types and a good electronic piano may sound identical to a grand piano, it’s hard to argue the tactile feel of a grand piano would feel more satisfying over an electronic piano. Computer keyboards are similar. Most computer keyboards come with membrane keys which are like electronic piano keys. They have a one-piece design where keys press down onto a membrane and make electrical connections which trigger that a key was pressed. Some keyboards come with mechanical switches which feel like the grand pianos of keyboards where every key contains a complete switch underneath and the ‘response’ and ‘travel’ come in combinations to suite a wide variety of preferences. I’ve used membrane keyboards for most of my life and they are perfectly fine. But, now that I have started to use mechanical keyboards, I am getting spoiled with the tactile feel of typing which can probably be best described as the difference between playing on a grand piano versus playing on an outstanding electronic piano. While I don’t think there are huge technical advantages, typing just feels more satisfying on mechanical keys and that may be all that really matters. 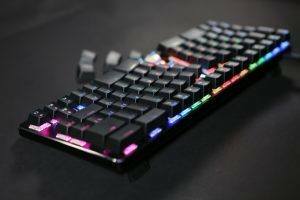 Check out Reddit’s mechanical keyboard group to see just how passionate a couple of hundred thousand enthusiasts are with their sharing of their latest mechanical keyboards. 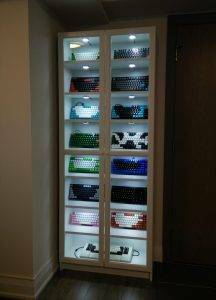 The image above from Reddit was upvoted over 20,000 times and shows one Redditor’s custom case with his custom mechanical keyboards. This picture got over 1,500 comments! That’s 15 keyboards in a case. Wow. I thought I had a ton of keyboards. Below is a Google Trend chart showing the relative popularity of Google searches for ‘Ergonomic Keyboards’ relative to ‘Mechanical Keyboards.’ People search about 3 times more for mechanical keyboards over ergonomic keyboards. The red line is the popularity of mechanical keyboard searches over ergonomic keyboard searches. However, this is an ergonomics review site and the vast majority of the mechanical keyboards you find for sale are not really ergonomic. Going through the mechanical keyboards on Amazon, the first five pages showed only non-ergonomic mechanical keyboards. I gave up after page 5 and assumed no one would find an ergonomic mechanical keyboard by just searching for mechanical models. You can get ergonomic mechanical keyboards though! And we’ve broken down all of the ergonomic mechanical keyboards we could find along with our reviews for them (at least the ones we have gotten in-house to test). If we’ve missed any, send us a note and we’ll add it right away. This guide is ordered alphabetically by the manufacturer so take some time to weave through all of the models below. The first section is for keyboards you can buy right now and the second section is for others that may or may not be available for a DIY build or purchase including rare keyboards that sometimes pop up on eBay. Key remapping and macros creations can now be done via text editor (as configuration files on keyboard are accessible). Kinesis is currently working on GUI tool for remapping and macros. You can add programmable foot pedals. The Advantage2 features low-force Cherry MX Brown tactile mechanical keyswitches, the rubber function keys (found on the original Advantage) have been replaced with Cherry ML low-force, tactile mechanical keyswitches. The keywells are scooped into a concave shape to reduce hand and finger extension. Hands rest in a natural, relaxed position, with the fingers curled down to the keys. Separating the keywells positions the arms at shoulder-width to keep wrists straight and perpendicular to the home row. The thumb keypad includes often used keys such as Enter, Space, Backspace, Delete and the combination keys, Control and Alt on the PC (Command and Option on the Macintosh). The two keywells are “tented” at an optimal 20-degree angle moderately raising the thumb side of the hand Tenting puts you in a more neutral, “handshake” posture and reduces the stresses caused by forearm pronation and static muscle tension. The keys are arranged in vertical columns (“orthogonally”) to better reflect the natural motion of your fingers. The integrated palm supports reduce stressful bending of the wrists (extension) and provide a convenient place to rest your hands when you are not actively typing. Self-adhesive, cushioned palm pads (included) can be attached for maximum comfort. The Advantage2 may look big, but it actually has a smaller footprint than a traditional keyboard and even many “ergonomic” keyboards because of the eliminated numeric 10-key. To encourage proper typing form, the Advantage2 features an optional electronic “click” that sounds right when a key press is registered. We reviewed the Matias Mini Quiet Pro Mechanical Keyboard even though it doesn’t really have much of an ergonomic shape. What it does have is a small footprint, which in some situations can be very relevant to ergonomics. Smaller keyboard = more room to move mouse + less distance to reach for mouse. If you’re crazy for desk space – or just want a keyboard you can fit in your laptop bag – the Mini Quiet Pro is a well-made, compact mechanical keyboard at a very reasonable cost. This is the only somewhat standard shape keyboard included in this guide. The Barocco is a compact (60%) and ergonomic split mechanical keyboard. It’s also smaller and lighter than most ergonomic keyboards making this one a bit more portable and easier to transport for folks needing to carry a keyboard. The Barocco comes with 2 other preset layouts, Dvorak and Colemak, layouts appreciated by programmers. In addition, both sides of the keyboard can be used as a stand-alone keyboard. You can get this keyboard with either Cherry MX Brown or Blue switches. This may be an ideal travel keyboard for folks that need to type in more than one place and don’t want to buy a couple of keyboards. You can travel with the pieces split so it fits easier in a travel computer bag. 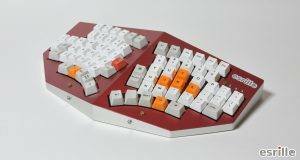 This is a custom built ergonomic keyboard from the folks at Profet Keyboards. It takes about 3 weeks after an order for them to build your custom keyboard. Expect to spend about $300 for one. I like that you can choose from a wide variety of materials such as bamboo, acrylic, Cherry, and Walnut and select from a number of colors. 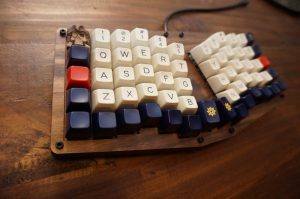 Wooden keyboards are not common and really stand out as well as add some natural materials to an otherwise plastic and metal device. You don’t get keycaps so you’ll need to order those separately from sites like pimpmykeyboard.com which is kinda cool because you can customize the colors, textures, shapes, and even put a little of your personal touch. I’ve seen keycaps that look like the moon, cartoon characters, star wars things, etc. Profet can also make custom ErgoDox keyboard builds. Their Facebook page has a bunch of examples of custom builds for customers like a recent one I saw with a Seattle Seahawks theme. 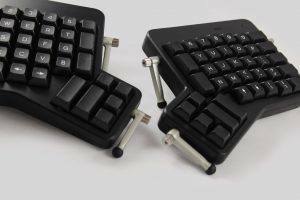 See our ErgoDox EZ review below for more info on ErgoDox. They also sell various parts for ErgoDox as well if you are interested in building your own keyboard. The keyboard is made up of two separate halves, which you can position independently. Comes with a Tilt/Tent kit composed of six legs that allow you to adjust the angle of the keyboard until it’s perfect. The feel of the keyboard is customizable, right down to how hard you have to press each key, and whether or not it clicks. You pick the keycaps that are right for you. You can move the keys around. You can make even better use of easy-to-reach keys with dual-function keys, an advanced ErgoDox EZ feature that allows you to use a key as both a letter (say, z) and a modifier (Ctrl, Alt, or anything else). The ErgoDox EZ is made to last, with uncompromising build quality, a housing that’s reinforced with metal where it meets the tilt/tent kit, and a generous two-year warranty. This keyboard was designed by a Japanese company based on the research of a Japanese professor and sized for the Japanese market. This is the only keyboard in this guide that factors cultural differences into the design. The company notes on their site that ergonomic keyboards designed in countries other than Japan are sometimes a bit larger for users in Japan. Research showed the 89th-percentile Japanese adult male middle finger length corresponds to the 58th-percentile U.S. adult male. This suggests that the standard QWERTY keyboards might be too large for people with smaller hands. The Esrille three-dimensional, tented design was created so that average Japanese adult fingers would reach up to the number key row from 1 to 0 while leaning the entire forearms on the table. The idea is based on the researches by Professor Masaru Nakaseko. He showed research that verified leaning the entire forearms on the armrests while typing helps to reduce muscular tension. He also suggested using the desk surface for resting the forearms by reducing the heights of the keyboard front edges and minimizing the steps down to the desk surface. Maybe if you have smaller hands this may be an interesting option. We haven’t reviewed a Maltron keyboard yet and it’s priced a bit high for us to splurge for one for test purposes. Note there is also a Maltron letter layout for keyboards also created by this company. The Maltron letter layout was created as an alternative to QWERTY. The Maltron letter layout is based on extensive “frequency of use” analysis and places the most used letters and functions where the fingers and thumbs may easily and comfortably reach them. It takes a few weeks to retrain to use this layout. Maltron keyboards are offered not only with the Maltron layout but also standard QWERTY and also Dvorak. Maltron offers single hand keyboards, dual hand keyboards, head/mouth stick keyboards, and an expanded keyboard. Their single hand keyboards are interesting and they claim word processing input speeds of 85 words per minute can be achieved with no strain. The picture here is their dual hand keyboard which can also be ordered with a built-in ergonomic trackball mouse. We reviewed this keyboard. As a longtime user of the Kinesis Freestyle ergonomic keyboard, I have often wished that it came with an option for mechanical keys. At first glance, the Matias Ergo Pro would appear to be the fulfillment of this wish – or the nearest thing to its fulfillment ever likely to materialize. It’s a split keyboard like the Freestyle, with tenting and palm rests roughly analogous to the Freestyle’s VIP3 kit, and it features the excellent Matias mechanical keyswitches. But there are notable differences too. 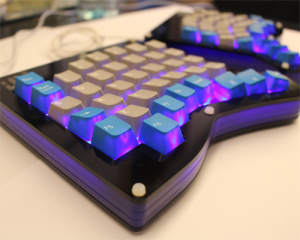 The Ergo Pro is much thicker than the Kinesis board – probably of necessity, due to its mechanical nature. And while the Matias keyboard comes with an equivalent of the VIP3 kit (and doesn’t sell it as an addon like Kinesis), it lacks an answer to the Freestyle’s V3 lifters. In plain English, this means that you have to the use the Matias palm rests if you want to tent the keyboard. More on that after the jump. The world – at least, the geeky part of the world – has waited many years for a split, mechanical ergonomic keyboard at a price that people not named Gates can afford. With the Ergo Pro, Matias has brought about an amazing fulfillment of that dream. 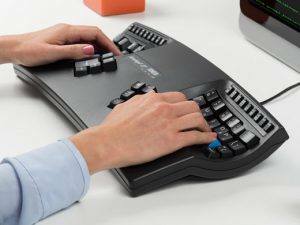 I believe this product will take its place with enduring favorites like the Kinesis Advantage – machines that pros and ordinary folks alike will use and love for many millions of keystrokes to come. The Cherry G80-5000, also known as the Cherry ErgoPlus (and as the Cherry MX 5000 or simply the Cherry 5000), was the first and only ergonomic mechanical keyboard produced and designed by Cherry. First introduced as early as 1994, it was the first keyboard to use Cherry MX Brown switches. According to Cherry, the Cherry G80-5000 was a test bed for experimentation with ergonomics. When it was released it took a person a couple of months to get used to this layout and this long re-training time was likely one of the reasons for poor sales. Back in 1994, this split concept was definitely out of the box. You can still find these keyboards from time to time on eBay but expect to pay over a grand. As of September 20, 2017, there was one listed on eBay for $1,400. Interested in learning more? Here is a video review of this keyboard. 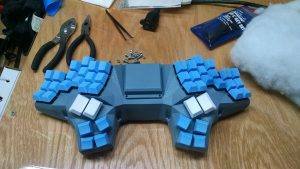 I found out about the Dactyl on Reddit. One user pointed out that the Dactyl checks all the most important boxes in ergonomics: Split; Ortholinear; Different finger travel based on finger length; Related to the above: tenting of some fashion; Maximum use of the strongest digits: thumbs; and Thumb cluster being close to the other keys. You can’t yet buy one of these or a kit to make one. We included this in our list as it sure looks like a cool keyboard! We’ll update this Guide as more information and options come out. If you are a bit technical or just interested in learning more, you can read up on the Dactyl page on GitHub. Note, the main image for this post is also a Dactyl that was modified to have built-in palm wrests. Just a small number of these keyboards were made from 1994-1995 and if you can find one on eBay expect to pay a small fortune. This one sold for over $1,600! Not a bad appreciation of value considering new ones sold for $179. This keyboard was also sold by Lexmark as the Lexmark Select-Ease Keyboard. According to one source, this keyboard is widely considered by both users and experts in ergonomics to be one of the finest ergonomic keyboard designs ever produced. This keyboard was the subject of a patent dispute from Mark Goldstein, founder of the Goldtouch company, over the design of the adjustable ball joint, and was settled by a subsequent licensing agreement. In late 1995, Lexmark sold off certain designs and tooling relating to buckling spring keyboards, including the tooling necessary to make the M15, to Maxiswitch. Maxiswitch never produced any M15 keyboards themselves and attempts to reacquire the tooling by interested parties have proved unsuccessful. Cool bit of history and an ergonomic keyboard with mechanical keys few know about. This keyboard is available for pre-order only and expected to ship by the end of 2017. The company bills this a keyboard for uncompromising typists and is heirloom-grade constructed. They mill the Model 01’s enclosure from two blocks of solid maple and use mechanical keyswitches similar to those found in the original Apple II. They note that they have custom-sculpted each of the 64 individual keycaps guide fingers to the right keys. The base keyboard can be laid flat, split, tented, or setup tripod style. Other features include fully programmable LEDs, true N-key rollover (NKRO) which is for folks that need to chord more than 6 keys at once, and application-specific macros. It sure looks different from other ergonomic keyboards and we are excited to late take one for a spin. Most keyboards as they age make you look like a slob as they get dirty and stained. Having a wood base may make this one age gracefully and add amazing character. Being solid wood and having mechanical keys, this is likely one of the heavier keyboards on this list. Jason, our founding editor, recently got his Kinesis Edge. We look forward to hearing his thoughts. This model was sold via Kickstarter and should be available for purchase starting November 2017. 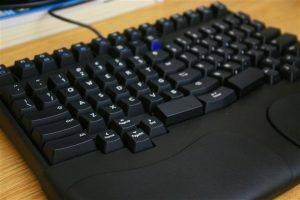 It’s billed as the first split keyboard designed specifically for gamers with features such as 20″ adjustable split, onboard programmable, Cherry mechanical switches, LED backlighting, 10 layouts, macro speeds up to 150 APS, No-install programming App, detachable palm supports, optional lift kit, and optional palm pads. If you are a gamer, this looks like an incredible setup! See gaming.kinesis-ergo.com for more info. Most of the last decade I’ve spent typing on Kinesis keyboards. Will get one later when they become available. 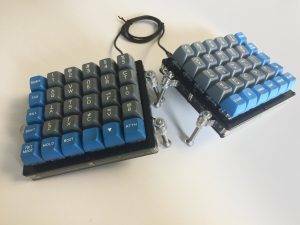 See this GitHub link for detailed instructions on how to build your very own Let’s Split v2 ergonomic keyboard with mechanical keys including links to order all of the parts you will need. The author does not that I2C isn’t covered in this guide (yet) because he didn’t do it for my build. I have no idea what I2C is so I looked it up which it turns out is a communication protocol. Guess that’s not really needed. I like that the author posted estimated pricing. You’ll end up paying about $200 or so for the parts plus the case not including shipping. You can clearly buy an ergonomic mechanical keyboard for less so this really brings home the point that you are not building this for cost purposes alone. The pic here is the version with the additional RGB underglow lights. This is about as compact as ergonomic keyboards come! Because these keyboards are open source, you’ll also find people mixing up projects and making custom boards like this Dactyl-ManuForm blend. The preceding Geekhack link has information on this blend build including links to the forked firmware. This blended version is shown in the image to the right. This blend has the thumb cluster from the ManuForm keyboard. This fork allows you can change the number of rows and columns fairly easily. This image shows a 40% version. 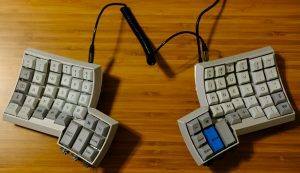 This is a DIY wireless split ergonomic keyboard. Note most of these keyboards on this page are wired (USB). This is one of the rare wireless split keyboard options. The designer has posted up the source and design files on this Reddit thread including PCB manufacturing files, PCB design files, PDF Schematics, Lasercutting files, Wireless firmware, QMK source, and Parts list with suppliers. The creator noted in this thread:” I figured that if I was going to learn an ergonomic board, may as well learn an ergonomic layout at the same time. Thumb clusters were part of the plan from the beginning, I used to get pinky pain after long typing sessions. The benefit of a completely different system is that I can still touch type QWERTY, something in my brain just switches right back when I touch a row staggered keyboard.” If you create a mouse layer with this keyboard, that is, use one layer to control your cursor, you could have one of the most minimalist dual hand keyboards on the planet. The name Nyquist comes from the Nyquist sampling theorem, which says that if you want to sample a signal to convert it from analog to digital and be able to uniquely reconstruct the signal later, then the sample rate has to be twice the bandwidth of the signal. I guess having two keyboards is a little like sampling twice? Cool name. 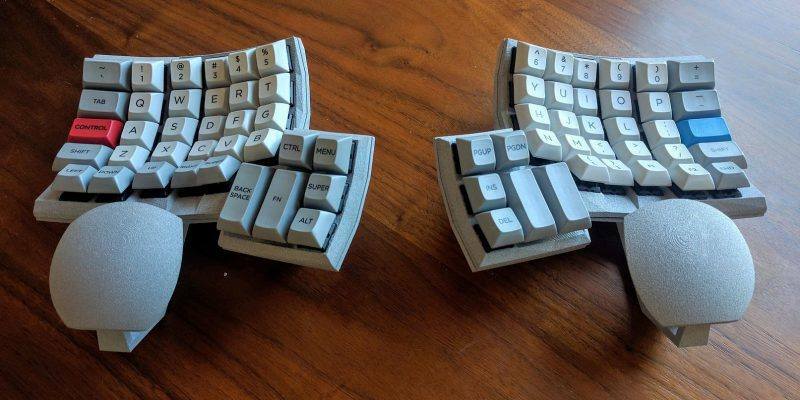 The Nyquist is a 60% split ortholinear keyboard, comprised of two halves with a 5×6 arrangement of keys. Just like how the Let’s Split is a split version of the Planck (a non-ergonomic keyboard), the Nyquist is a split version of the Preonic (a non-ergonomic keyboard). There is the option to have 2u keys in place of 1u keys in both the lower left and right corners with holes for Cherry PCB mounted stabilizers. There’s also a spot on the PCB for a pushbutton switch to reset the Pro Micro for flashing. This push button makes it easier to jump the reset and GND pins (no more taking a wire/tweezers/screwdriver). The two halves are connected to each other via a TRRS cable, which is a 4-pin cable. The Planck is a small, fully programmable ortholinear keyboard by OLKB. It consists solely of the alpha, most punctuation and modifier keys in a 4×12 matrix. The ortholinear layout is in between the “typewriter” row staggering of a standard keyboard and the column staggering of more traditional ergonomic keyboard. Ergonomic benefit and easy of transition are somewhere in between as well. I started using a Planck when I was getting serious after 20 years of looking at my hands while typing slowly and wanted to address significant pain I was having because of my keyboard. 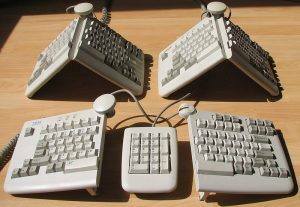 I didn’t have wrist issues so split or negative tilt keyboards weren’t really on my radar. The Planck addressed the three issues I was having from using a traditional, full size keyboard. I developed shoulder pain from having the mouse so far away, hand pain from reaching for often used keys like Enter and Backspace and finger pain from the lateral motion of typing on arbitrarily staggered rows. The Planck’s small size means that there isn’t any key more than a one key away from the “home row”. All the other characters and functions are available through layers accessed with chording keystrokes primarily using thumb keys. Since the keyboard is completely programmable the layers can consist of almost anything the user can image using the open source QMK firmware. For those that feel the Planck’s small size is a bit extreme and don’t mind something a little larger, OLKB offers a larger 5×12 key model called the Preonic that adds a number row and in development is the 5×14 key Subatomic that adds two extra columns to the Preonic layout. Parts to build the Planck and other OLKB keyboards are available from olkb.com and occasionally Massdrop. There is no option currently for ordering a complete keyboard. The PCB, the brains of the keyboard, comes pre-programmed with a standard layout and further layout customization can be explored at the QMK documentation site qmk.fm. Note: Mini review on Planck via Reddit user deaconblue42. You can check out a short video on the Planck keyboard. 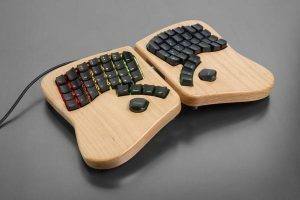 This is an open source ergonomic keyboard for gamers. We haven’t tested it but it sure looks interesting. The main features are: hand shape design, split keyboard, thumb cluster, and fully configurable layouts. You can read all about their development on their blog. They chronicle the development process as well as the reasons why they developed the Shortcut keyboard. For instance, Luis a founder blogged: Every day, for many hours we are using a device that was designed over 30 years ago, for the tasks and habits of that time. And that device is based on the typewriter, that was created 200 years ago. This means that the keyboard we use daily has design limitations of a technology 200 years old. How crazy is that? When a player has contractures on his back or something as severe as carpal tunnel syndrome on both wrists, is it because he just plays so much that the body can’t handle it? I think it’s a matter of the keyboard not being designed for today’s activities and the lack of easily accessible information about how to take care of our own health. I want to tackle these issues. I want to create the best possible peripherals for gamers and help to spread the correct information so we can make better decisions regarding our performance and health. Something that in some cases will affect our professional careers but in every case will affect our overall happiness. That’s why I’m attempting to create the best gaming keyboard. What I’m going to show you is just a prototype under development, but already it’s the best keyboard I’ve ever used. 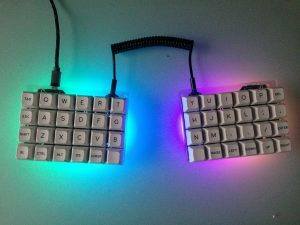 Also, check out Shortcut’s latest project, Raise, a new split keyboard. During their testing, they determined people need a couple of months of daily practice to get used to their keyboard, so they set off to create a keyboard that can increase health, performance, and comfort but doesn’t require an adaptation period. Raise is their version of an ergonomic keyboard that doesn’t require much re-learning time. The key features of Raise include a split/not split design (can connect back into one piece), 8 thumb buttons, a compact design, split palm rests, and customizable software. Note: As of August 20, 2017 we verified via the Truly Ergonomic website that this keyboard is out of stock and not for sale. Also note that the company has an F rating with the BBB. Ouch. We reviewed this keyboard back in 2012. 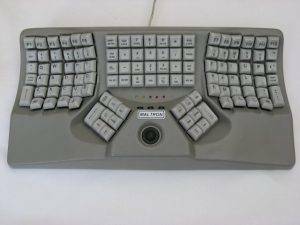 Here is our summary from 2012: While I don’t agree with the self-superlatives used in TE marketing – (“The Truly Ergonomic Keyboard is properly designed, and therefore different from other keyboards…”) – I do believe there is much to be said for this design. It combines a small footprint, an innovative layout, and mechanical keys into a high-quality package with a detachable palm rest. At $229 as of this writing, it is not the least expensive keyboard on the market – but it’s not the most expensive either, beating the Kinesis Advantage by a handy $40 on retail. Best of all, there is a 60-day return policy, so the Truly Ergonomic keyboard is at least truly guaranteed. The Diverge 3 is a USB ergonomic split keyboard with individual LEDs illuminating each switch and wrist rests. You can choose between Cherry MX or Gateron mechanical keys. Note this is a kit and you will need to put the parts together. If you don’t know how to solder, this is probably not the kit for you. The Diverge 3 has 72 keys, is NKRO enabled, and supports up to 8 layers. They use Animus firmware so you can fully customize keybinding, macros, media keys, FN, spaceFN, dual-role keys, and more. Unikeyboard also sells the Diverge TM2 which is a magnetic portable split ergonomic keyboard with 46 keys and support for up to 13 layers. The Diverge TM2 also has a backlight option. 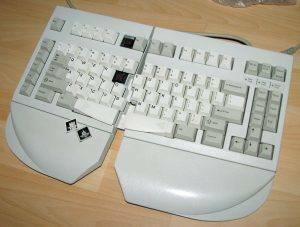 We were fortunate to get an early release sample of a new ergonomic keyboard, X-bows, which launched via Kickstarter. See our review. 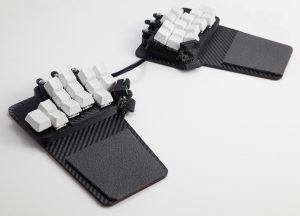 The X-Bows is a USB ergonomic keyboard with mechanical keys. It’s compact but offers a full keyboard experience and works across Macs, PCs, Chromebooks, and Linux machines. What is unique about this keyboard is what the company calls a “cross bow radial design” where the keys are arranged in a pattern to reduce the amount of lateral movement your wrist and fingers need to travel to type. If you use this keyboard properly, you can do the vast majority of your typing without needing to move your wrist around laterally. Overall, I can tell the company that makes this keyboard spent a ton of time in meetings working out details. They created a unique design with enough attention to detail to show they wanted to balance ergonomics with cool design, like the font choice on the keys and the standard USB-C connector port. Let us know if we missed any! Thanks for making it down here well past the 5,000 word mark.